Outbound touch points delivered via emails, phone calls, events, direct mail, and other paid channels play a key role in ABM. When combined with other tactics, direct outreach activities add a proactive component to the tasks of identifying, engaging, and converting new accounts. But in order for targeted outreach to work its magic in an ABM setting, you need to know how outbound channels exactly fit in a modern account-based marketing process. That’s what we’ll talk about in this blog post. We’ll take an in-depth look at specific roles that direct channels can fill in an ABM program. Then, we’ll discuss concrete steps for you to integrate outbound channels into these functions. How can outbound channels move your ABM process forward? We’ll go over each item in detail below. But first, let’s talk about why ABM needs outbound to work properly. If we step back and revisit what ABM means, it’s easy to see why outbound naturally supports account-based marketing efforts. We use ABM to find and target accounts with the highest potential value, then build a thorough understanding of each potential customer, so that we can match our overall strategy and product to what the target company needs. This means treating each account as a single target market, with all stakeholders involved in the buying process as the target prospects. This, in turn, requires having the right data and insights, mapping relevant content, and establishing interconnected relationships with each individual in the decision-making unit (DMU). That’s where outbound channels make a difference in ABM. 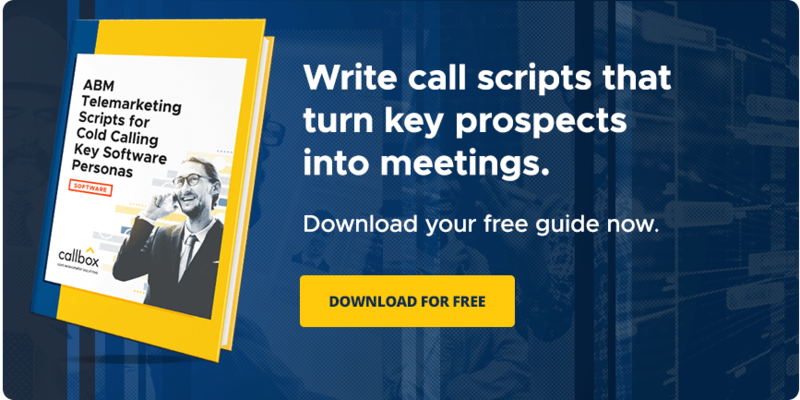 Targeted outreach amplifies your ABM efforts by helping you focus on specific opportunities through scalable, one-on-one touches. While inbound channels work well for broader ABM activities, it’s going to be outbound tactics that let you pinpoint and engage each opportunity. As Marketo points out, data is the foundation of a successful ABM strategy. That’s because data enables authentic personalization, allows more granular segmentation, and makes marketing and sales more closely aligned with each other. This makes ABM programs very data-intensive and data-driven, requiring dozens of data fields and hundreds of data points to carry out tasks like developing and keeping track of ideal account profiles and target buyer personas. Email activity and responses can provide insight on each stakeholder’s product fit and interest. Live phone conversations help you gain a deeper understanding of your overall target account and the stakeholders themselves. Event marketing initiatives are excellent sources of information to measure how far along the buying cycle your target prospects are. Successful ABM initiatives are also based on building genuine relationships with stakeholders and being able to leverage these relationships not only to convert prospects into customers, but also to turn them into brand advocates. Sigster argues that authentic relationship is everything in ABM. Unlike traditional marketing where the priority is to push as many leads as possible into the funnel, ABM emphasizes finding the people you really want to engage with. That’s where building meaningful relationships comes in. To be genuine, relationships require focused engagement, not broad touches. Outbound channels facilitate the needed one-on-one interaction to start and grow authentic relationships. That said, it’s not surprising why emails continue to be a top ABM channel. Targeted emails remain the workhorse not only of traditional marketing but ABM as well. 61% of marketers rank emails as the most effective ABM channel. 49% of marketers consider email segmentation a crucial tactic. Emails yield 2x higher ROI compared to most other ABM channels. One of ABM’s primary goals is to deliver the right content to the right stakeholders so that they’ll move from one stage in the sales funnel to the next. The idea is that relevant content drives buying decisions more effectively than any other messaging approach. According to a recent study from Ascend2, around 62% of marketers mention personalized content as a top-performing ABM tactic. Results from a CEB survey of B2B marketers also reveal that individual stakeholders are 40% more likely to buy from a vendor that provides content tailored to their interests and needs. But content can only take you so far. Marketers who put out content on their company website or social media communities have little control over the actual audience each piece of content reaches. In ABM, this isn’t good enough. Content still needs to cross the last mile to the appropriate audience. Because targeted outreach enables direct, precise interaction at scale, it’s an ideal way to deliver relevant content. Nurture emails can be used to distribute resources to stakeholders at different stages in the sales funnel. Targeted phone calls are an effective channel for content syndication. Remarketing through targeted ads can increase your content’s engagement and conversions. A Demand Gen Report survey finds that almost 60% of companies think their buying cycles have increased, while a Brightfunnel study published last year indicates that it now takes 52% more marketing touches to close a deal. This means that engagement is now more crucial than ever at moving potential customers down the conversion funnel. Stakeholders need to stay engaged throughout the sales process in order for them to approve your offer. Otherwise, they’ll simply leak out of your pipeline. As DemandBase points out, somewhere around 83% of companies say that ABM’s main benefit is that it helps them improve their engagement with target accounts. Marketo also highlights the importance of marketing and sales alignment at driving ABM success. In fact, stats compiled by RollWorks show that 66% of companies cite increased ABM pipeline as a result of better marketing and sales alignment. Sales provides the needed insights for knowing which accounts to prioritize and which stakeholders have a real impact on buying decisions. With this info, marketing then draws up content maps and works out when and how to deliver relevant content to each stakeholder. Both marketing and sales then follow this plan for communicating and interacting with stakeholders in the target account. Conclusion: An effective ABM program needs the scale, precision, and human touch of outbound channels. Especially when combined with inbound tactics, targeted outreach drives the ABM process forward. Looking to step up your ABM game? Callbox’s multi-touch ABM solution can help you find and win your most profitable customers. We combine outbound and digital channels to identify, expand, engage and convert high-value accounts. Contact us today.